Found out about this at San Diego Comic Con: The same animation team that brought us Howard Lovecraft and the Frozen Kingdom (we talked about that!) returns with a new feature called Hallowaiian. 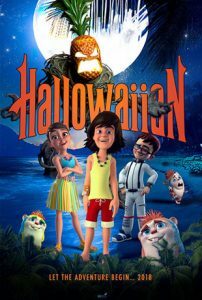 “In the vein of The Goonies, E.T., and Jurassic Park, Hallowaiian follows three kids who must put their differences aside to save the island from a monster thought only to live in legends. Kai, Leilani, Eddie and the Menehune, Hawaii’s mischievous creatures, must band together to stop the monster they have mistakenly awoken. Facing great dangers along the way, the kids realize the true meaning of courage, friendship and tradition. The voice cast stars Hawaii Five-0 alumni Teilor Grubbs and Mark Dacascos with Tia Carerre (Wayne’s World) and Kiefer O’Reilly (Howard Lovecraft).” Once again it’s directed by Sean Patrick O’Reilly from Arcana Studios. Looks like it should be available this October — of course. Posted in: DVD and Video, Movie News.